How old is this T? Can you 'age' this T? I do not own this T, I am trying to find out the type of T it is and the possible year this photo might have been taken. The person on the left was deceased in 1922, so the picture would have to have been taken prior. If you can help, please add a comment below.. Comments for How old is this T? 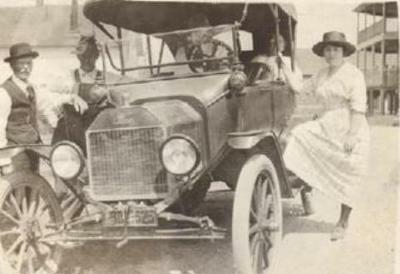 This touring car is a 1915. Ford added the fire wall cowl in 15. The front fenders are 14 with the brows which was common to use up previous year parts. So this tells me it was built in early 15. The front spring is tappered and the wishbown is over the axle which also dates the car. The head lights are 15 electric with the new non-brass rims.